SAN DIEGO — San Diego mayor, Kevin Faulconer, announced this week the city has begun installing 330 on-street parking corrals for dockless devices throughout downtown San Diego. "They are often strewn around the sidewalks, so it might not be a bad idea," said Erin Finegold, a Cortez Hill resident. The installation of corrals comes as the mayor waits for his e-scooter regulation proposal to go in front of the San Diego City Council. The mayor's spokesperson said that the 330 dockless parking corrals will be installed using existing money. "I don't think they are going to work. 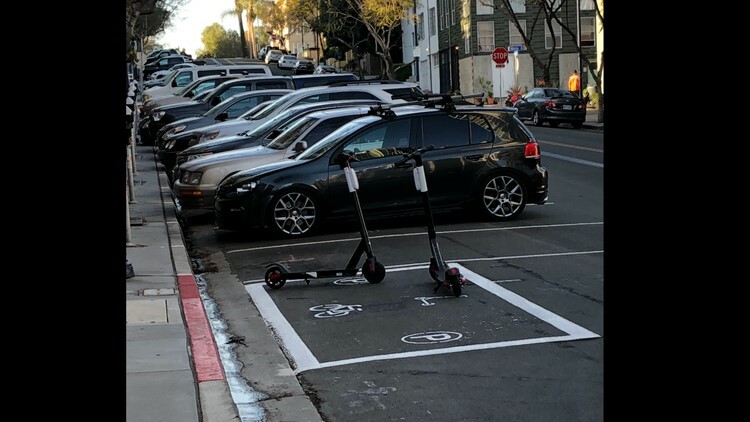 No one is going to use them because the whole essence of the scooters is the convenience of just dropping them wherever you are," said Steven Dotson, who lives in Cortez Hill. The mayor hopes the corrals will prevent scooters and bikes littering the sidewalks. "I drive a van for a living. Sometimes they are in the loading zones, so we have to move them," said Dotson. A city spokesperson said that by installing corrals in red zones it does not take up a parking space and will not be in front of fire hydrants. The mayor's spokesperson told News 8 the dockless parking corrals in front of red zones will not hinder emergency crews. He said cars parking in a red zone is unsafe. For now, only downtown San Diego and Cortez will have the parking corrals. "It might take a while to catch on and hopefully people will join the gang when they see everything parked neatly in the box," Finegold said. "Approximately 330 designated parking spaces of various sizes will be created for dockless scooters and bicycles. This work is starting in the Downtown area and is being paid for using existing City funds. In February, Mayor Kevin Faulconer proposed new regulations for dockless scooters and bikes to improve public safety. These regulations call for reduced speeds in certain areas, parking and staging rules, fees and permitting for scooter and bicycle companies. The proposed regulations will go before the City Council for consideration later this month. The intent of the parking corrals is for the companies to use them for staging, rather than on sidewalks. With education and practice the expectation is that riders will also use the corrals as primary locations for parking." "Installing corrals in current red zones downtown is a beneficial use of street space deemed unsuitable for automobile parking and likewise doesn't eliminate any parking spaces downtown."